LivePulse offers system and application monitoring essentials in the cloud. 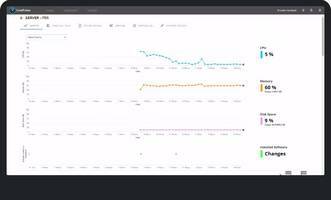 TAMPA, FLA. (PRWEB) FEBRUARY 28, 2019 - SunView Software, a global provider of service management solutions for the enterprise, has announced today the release of LivePulse, an easy-to-use and affordable monitoring solution for business. The company, which is known for its innovative ChangeGear IT Service Management (ITSM) platform, expands its offerings with turnkey monitoring and automation capabilities that help companies gain insight into potential issues and resolve them before they happen. LivePulse offers a simple and intuitive dashboard interface that provides IT staff with visibility into the health and performance of critical systems and applications. Users can monitor many types of systems including Windows and Linux servers, web applications, social media feeds and more. Other features include data visualization for performance analysis, real-time alerts of system events and automation of routine tasks. Additionally, LivePulse seamlessly integrates with ChangeGear and other ITSM platforms to automate the creation of problem tickets when alerts occur. This allows companies to improve communication and collaboration, while making processes more efficient. LivePulse is currently available for purchase. Users can quickly get up and running in five minutes or less with a 14-day Free Trial. About SunView Software: Founded in 2003, SunView Software is a provider of IT Service Management software that helps companies to better deliver, manage, and monitor IT services across the enterprise. SunView is pioneering innovations in artificial intelligence to drive smarter automation, predictive insights, and customer satisfaction. By combining cutting-edge technologies and a best-in-class software platform, SunView provides cost-effective and efficient solutions that enable more responsive IT for the organization. Visit https://www.SunViewSoftware.com for more information.